The theatrical trailer of the upcoming Telugu movie Awe was released recently and has become the hot topic of discussion among film buffs. A heroine-centric film, it has Kajal Aggarwal, Nithya Menen and Regina Cassandra playing the main leads, and the story revolves around these ladies. Interestingly, two leading heroes of the Telugu film industry, Ravi Teja and Nani, have done the voiceover for this film. While one has lent voice for a fish, the other has done it for a tree, and the film is told from their perspective. It may be mentioned here that Awe is Nani’s first production venture. Various reports have emerged about the characters played by the heroines in this flick, ranging from Nithya Menen playing a lesbian to Regina Cassandra essaying the role of a drug addict to Kajal Aggarwal playing a character with shades of grey. However, we will get clarity on their roles only after the film hits the silver screens on February 16. Regina’s look in the movie has already created a huge buzz. Speaking to TOI about her role, Regina had said that it took her team a lot of research to finalise her look. She said that her stylist Shanthi, and tattoo artistes Mo and Vijay had done an exemplary job to create the right look for her. Doing a role that has shades of grey, Regina will be seen sporting tattoos specially designed for the flick, including a tree and snake. 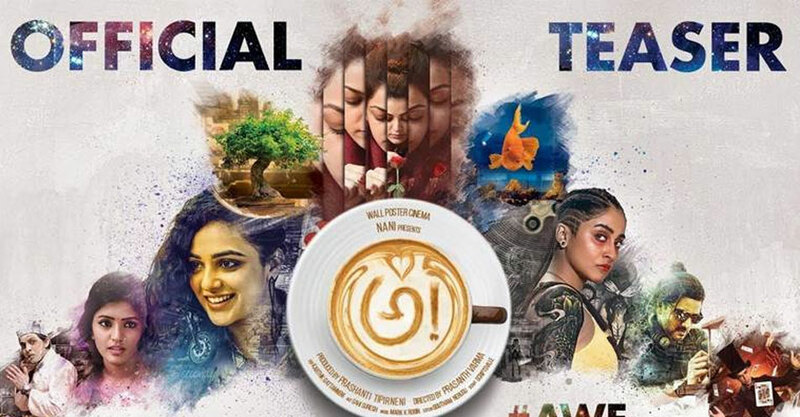 Directed by Prasanth Varma, who is making his directorial debut with this movie, Awe is produced by actor Nani and Prashanti Tipimeni under the banner Wall Poster Cinema. Mark K Robin has composed the tunes for this flick with Karthik Ghattamaneni wielding the camera and Goutham Nerusu editing it. The star cast of Awe also includes Eesha Rebba, Srinivas Avasarala, Murali Sharma, Rohini, Priyadarshi Pullikonda, Hari Teja and Devadarshini. Nani’s last release MCA did well at the box office and the star is gearing up for the release of his next project, Krishnarjuna Yudham, which is due for release on April 12.